“I want waterfront property” is a common phrase Realtors hear in Coastal Eastern North Carolina. Believe it or not, this can be a very complicated request. Waterfront, especially on the inner banks side of the coast line, can mean many different things. I have put together this information to help make your adventure in finding the perfect waterfront property a little easier. Before you get started looking for waterfront properties, here are a few things to consider. 1)	What kind of view do I really want? 2)	The river and the sound may not be the place to dock your boat unless you can put it on a lift. 3)	Are you buying waterfront to fit your boat or will you buy a boat to fit your waterfront? 4)	Knowing that there is very little lunar tide on most inner banks waters, what depth do you really need? 5)	What is your mast height and is there a bridge that may impede your access to the open water? 6)	Would purchasing a boat slip at a marina better fit your budget and boating needs? Let me roughly define the different bodies of water for you. Hopefully, by understanding what each offers, you will be able to refine the search to meet your needs thus saving a lot of time and energy. 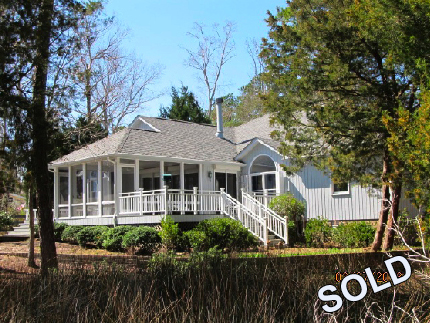 Coastal NC Sounds: Sound front property is the closest thing to living on the ocean front without the ocean. North Carolina’s coast contains seven coastal sounds, all with varied sizes and depths of water. The Currituck, Albemarle and Pamlico Sounds are separated from the Atlantic Ocean by a 200 mile long string of narrow barrier islands known as the Outer Banks. Albemarle Sound is the largest freshwater sound in the world and the Pamlico Sound is the largest sound on the east coast of the United States. The Pamlico Sound is considered a shallow body of water; it is 28 feet at its deepest, mixed with many sandy shoals and small islands. Its size ranges from 80 miles long and 30 miles wide at its broadest point. The wind-driven tides can be unpredictable and the water conditions seem to change on a moment’s notice. The sounds of North Carolina are the nursery for much of the seafood and wildlife for Eastern United States. The sounds are fed by a multitude of streams, creeks and rivers from the west with navigable inlets to the Atlantic Ocean to the east. 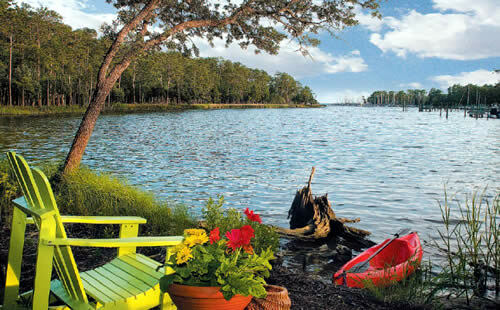 The Intracoastal Waterway (ICW) runs through many of the connecting sounds allowing for protected travel from Maine to Florida. Rivers: The Rivers and streams flow from the western regions of North Carolina. Where they begin to reach the flat coastal plain they slow and widen as they merge with the waters of the sounds. The Neuse River is the longest river in North Carolina and the widest river in America. 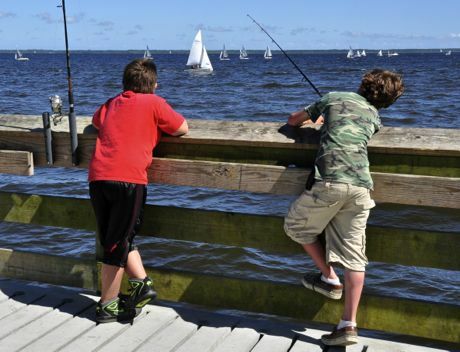 Six miles across at its mouth at the Pamlico Sound, this river is known for its breathtaking views, outstanding fishing (both recreational and commercial), and the abundance of wildlife. It is an integral part of the second largest estuarine system in the US. The boating, whether it is cruising or sailing, kite-surfing or kayaking is without compare. The ICW runs along its waters, making a turn south across from Oriental, NC as it makes its way towards the Bogue Sound and the inlets to the Atlantic Ocean. Creeks: The thousands of miles of creeks in Eastern North Carolina are surprising to many people when they first visit. Often mistaken for rivers, it is not unusual for creeks to span a half of mile at the mouth with depths of 7 feet. Creeks are protected from the ever-changing conditions of the rivers and sounds. Many of the creeks range from freshwater at the head to brackish water as they near the sounds and rivers, allowing for a diverse population of wildlife and marine fisheries. 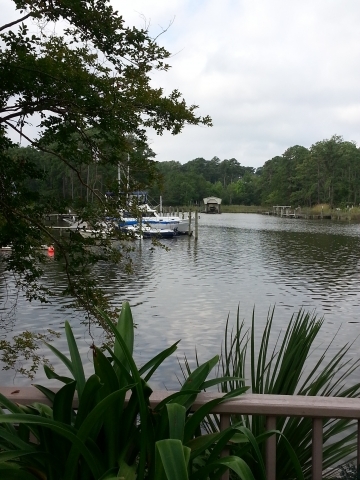 It’s in these protected waters where you will often find docks and marinas. 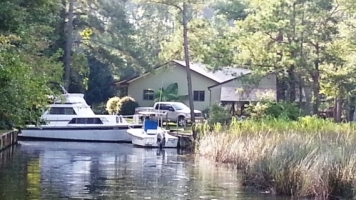 Canal front: You’ll find in Eastern North Carolina a scattering of man-made canals running throughout many towns and villages linking interior land with the creeks and rivers. Often, these canals are deep and navigable waters, usually lined with docks and boats of all kinds. They allow for deep-water, protected dockage just steps from your back door. They are often called hurricane holes, as is the one shown below. Guts and other “dockable” waterfront: Sometimes it is not all in the name; see a photo of Hogs Pen Gut below. There are shallow basins that branch off the coastal creeks called guts. These waters can be beautiful and protected areas with sometimes 3 to 4 feet of water depth. Many of the marshes have a stream running through and are perfect for launching kayaks and docking small boats. Combined with the pristine views and wildlife, these are often private hideaway home sites. Some folks would have you believe that waterfront is anything that you can’t jump across flat-footed without getting your feet wet. Don’t let them fool you; deep ditches and puddles are not considered waterfront. Come to Mariner Realty to let our experts help you find your perfect waterfront property. Is it the right time to buy in Oriental? With most major markets picking up around the county, Oriental, North Carolina is starting to feel the energy. Although there were a couple of sputtering starts, the real estate market in 2013 began with a slow steady momentum and now is beginning to pick up a little speed. Many of the foreclosures have been purchased, the real estate prices are beginning to rebound and the interest rates are starting to bump up which is pushing the people who are sitting on the fence to make a move. You can still find a limited inventory of nice, site built houses under the $100,000.00 categories but they are getting difficult to find. The under $200,000.00 home is by far what is hot on the real estate market right now. Generally these are the 3 bedroom 2 bath homes in established neighborhoods with amenities such as garages, decks and/or porches, as well as upgraded kitchens and baths. It’s the waterfront houses under $400,000 that is the buyer’s dream market. This is where a buyer can still find waterfront homes with many desirable amenities at prices that would be hard, or impossible to replicate. The waterfront lots were priced higher than these homes 8 years ago. Who would have believed that a 2,800 heated square foot elegantly designed home with to die for kitchen, baths and other top amenities, located on deep water with a dock and boatlift, large multi-car garage with workshop, expansive deck and screened porch, beautifully landscaped AND in the Oriental area would have an asking price of only $379,500. 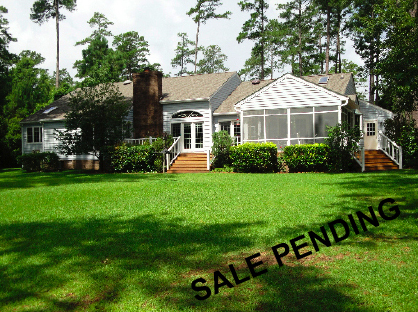 This home is shown above left and a sale is pending. As the banks and mortgage companies continue to ease up on lending, the markets around North Carolina and the country continue to improve. It will not be long before waterfront homes at these prices will be a thing of the past. The home shown below recently sold for just under $500,000. Call or email us at Mariner Realty. Our experienced, professional Realtors can answer your questions or assist you with buying or marketing your home or land. Although the housing market is starting to make a comeback, today is still a buyer’s market. I often tell my home owners we have to sell the sizzle. Let’s get started on 10 relatively easy steps you can take to help increase the opportunities to attract that perfect buyer for your home, i.e. give your home that extra sizzle. Here are my top ten, low cost, sure fire ways to make your house stand out above the others for sale in your price range. 10. Remove excess junk and unneeded tools from the garage. Organize to best utilize the space in a neat usable manner. Can a car fit in the door or can you find the work bench? Make the garage look spacious and useful, not small and cluttered. 9. Make extra rooms look like delightful additions, not junk storage space. If it is a home office, organize and make it an appealing place for someone to work. Same goes for the guest bedroom or at home gym. 8. Make the Master Bedroom gender neutral. Decorate with neutral earth tone colors. Put away all personal things in the bedroom and bathroom. Organize the closet and clean out as much as possible; it will appear larger and…Bigger is Better. Freshen up bathrooms with new shower curtains/liners and fluffy new towels. 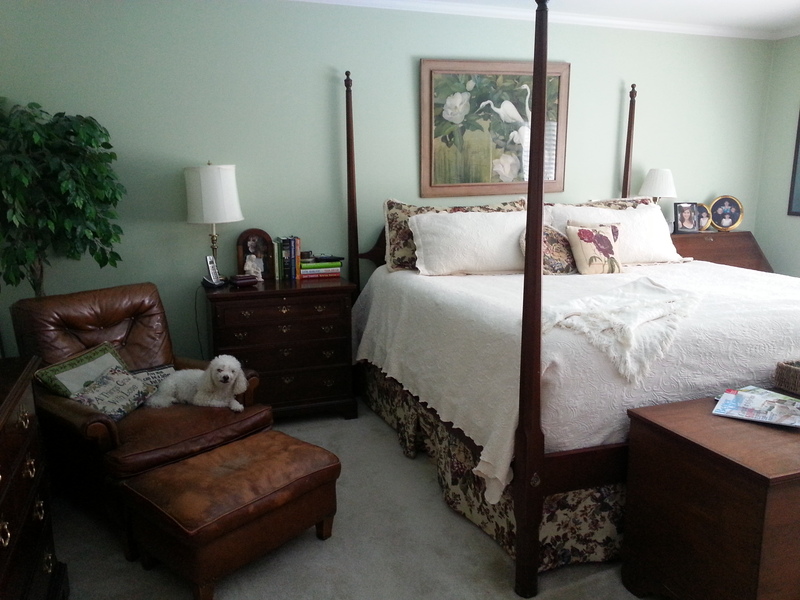 If buyers are uncomfortable viewing the master suite, they are not comfortable making an offer. A little effort can make a huge difference. 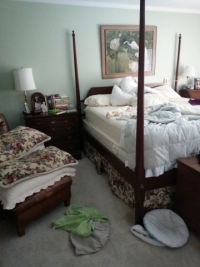 See the before and after photos of the master bedroom shown below. 7. Kitchen cabinet tops need to be cleared as much as possible. With the exception of fresh flowers or a bowl of fruit, if you do not need it, store it out of sight. Clean out drawers and cabinets; if they look over-filled or cluttered, it will give the appearance of being too small. Remove magnets, photos and other things attached to the refrigerator. Make certain the counter tops and appliances are wiped down with cleaner after each use. Freshen they kitchen with new coordinated hand and dish towel sets. 6. Stage your house for everyone’s taste. Clear away the clutter everywhere you see it. Put away as many of your personal things as you can. Less is more when selling your home. Allow buyers to visualize living in your home, not see how your family makes this your home. Take out excess furniture. It makes the rooms appear more spacious and allows them to better see their own furnishings in the same space. Always remember light earth tone colors are more appealing to the majority of people; always a good choice when selling. 5. Get rid of any unpleasant smells. Wash the dog bed and the dog. Be aware of smelly foods, tobacco products, moldy areas; these smells turn buyers off. Do not try to cover up by smells with a lot of perfumed air fresheners. This will clear up most of the problems noted above in #5. Clean the windows, floors, carpets, tile grout, doors and cabinet fronts and jams. If you see it, CLEAN IT. 3. Let in as much natural light as possible. Take down or open your drapes, including the sheers, during the day. Wash your windows as noted above and consider painting your walls a soft white color. Trim back the shrubbery from the windows. * Install high wattage bulbs. 2. Entice buyers to want to take a look with CURB APPEAL. Welcome visitors with an inviting porch and a clean or freshly painted front door. Keep a well-manicured, freshly mown lawn. Create outside, lifestyle environments such as a cozy front porch, back deck cook-out area, or comfortable seating overlooking the water. 1. The primary key to selling a home is to price it correctly. You can spend a lot of money fixing up and marketing your house, but if it is priced wrong the only guarantee is it will not sell. Developing the correct price requires specific information on the market in general and the real estate market in your community. Let one of the Brokers at Mariner Realty prepare a free market evaluation to determine a competitive price for your home. Our evaluations include information regarding comparable homes that have sold recently in your area as well as prices and amenities of current houses on the market in direct competition with yours. Together, with your home ready to show, the correct price and an experienced team of agents, we will be successful in finding a buyer.